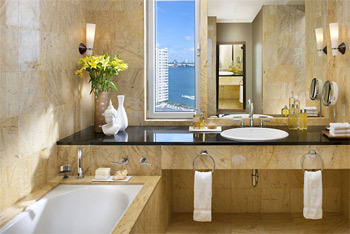 Frank's All Surface Refinishing has been refinishing tubs in various Hotels in South Florida for the last 18 years. We have the necessary manpower to complete large scale renovations, working with construction companies or with Hotel management. We can complete small repairs on even single bathtubs and also provide year round maintenance to your facilities. Whenever bathtub bottoms collect dirt and grime from everyday usage, it reflects on the overall ratings of your hotel. If full resurfacing is not required, Frank's All Surface Refinishing can clean the bottoms of the Bathtub and apply a Permanent Non Skid Bottom, which will solve the immediate problem of a dirty looking tub, without the cost of a full Bathtub Refinish. Our pricing is extremely competitive, and the results will enhance the overall condition of your hotel and your rating! If you are planning a complete renovation, or have need to maintain the quality of your hotel on an ongoing basis, call us. We are fully licensed, insured and have the experience necessary to complete any project.